So, how are you enjoying the mild winter that we are having here in Northern Arizona? Temperatures in the 50- to 60-degree range during the day. Barely below freezing at night. And snow? Forget about it! If this seems like an ideal scenario . . . . think again. Projecting these drought conditions into the summer, it is downright scary to think about a wildfire season on a par with last year's epic disasters, which scorched an area more than twice the size of Phoenix. In total, over 1,100 square miles burned. We were brought face-to-face with the specter of loss just this past week when a conflagration consumed an historic ranch home in Skull Valley. The lucky resident escaped with his life, but the charred structure was a sharp reminder of the suddenness and finality of such an event. Now imagine that fire in your neighborhood. Imagine it igniting an entire forest of tinder-dry trees and underbrush. Picture it getting completely out of control. Based on now-defunct stewardship practices, the forested lands of the Southwest have become grossly overgrown with small caliper trees and thick underbrush. This unfortunate policy of wildfire suppression is proving difficult to correct. The resulting tinderbox results in huge fires with names that haunt us still: Rodeo-Chedeski, Wallow, Schultz. One of the links at the bottom of this article describes prevention and restoration measures for California forests and yards. I've included it for its clear description of a healthy forest. "The ideal healthy forest is an open, park-like stand with widely spaced overstory trees (conifers and hardwoods). Most standing dead trees are removed and live trees are thinned. The understory consists of scattered shrubs, small trees, grasses and wildflowers. This breaks up the 'fuel connectivity' and reduces the risk of high-intensity fire." I am proud of my current neighborhood's community-wide effort to minimize the danger of destructive wildfire in Manzanita Village Cohousing Community. Neighbors (mostly 55 and older) have banded together and voluntarily begun to remove brush and small trees from the valley below our houses. With at least four acres to tend, the job is huge. We've even used goats to clear away some of the underbrush! Lately this fire-awareness has also factored into my choice of building sites for my new house design. Like most people, I love trees, and want to snuggle the house right up next to them. However, one must keep in mind those same trees could bring flames within reach of the eaves of the house. Trees that are going to be near the house must be 'limbed-up'. The lower branches of the tree must be removed to prevent brush fires from climbing them like a ladder. The trees and other landscaping must be irrigated, so that they remain as green as possible. Ideally, landscaping would be kept a good thirty feet from the house, but this is not always possible or desirable. A number of solutions justify a bit of extra water use to support lusher plant species or even a pond within that 30-foot buffer zone. Being fire wise is not a matter of fortune. Creating a defensible space around your house is a first step to peace of mind and safety. 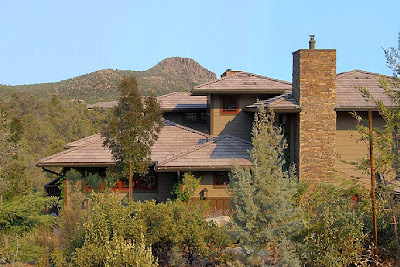 Check out the links below for some more information about fire-wise landscaping and house construction techniques that have found success in our great Southwest.